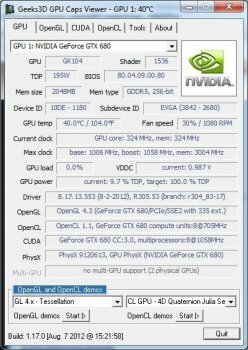 GPU Caps Viewer is a graphics card utility that allows to quickly see the capabilities of your graphics card / GPU, displays the GPU temperature, offers a convenient OpenGL extensions database and OpenGL API support, provides a GPU-burner facility as well as an online validation. 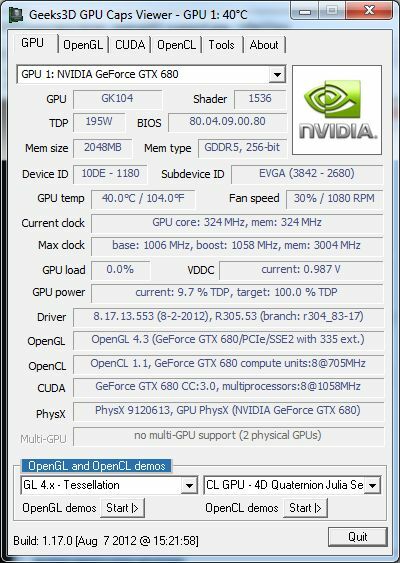 Seems useless, as it doesn't work on an older nVidia 8600GTS, an ATi Radeon 4850, or an ATi Radeon HD 2400. Perhaps the problem is the problem of the video cards, but the program does not exit cleanly, nor does it explain why the problem exists. There is a log that is created, but it is a zero-byte file. I couldn't download with Firefox (the webpage says 'Forbidden'), only with IE - otherwise it's a neat little app, 5/5. what a stupidity, did you all see that 403 on that site? Been using this for about a month not only as a stability tester, but as a great benchmark tool. I am completely satisfied and to top that it's completely free and getting better all the time!